“Parliament is a forum for exchange of views. If you are not allowed to speak, then what is the point? 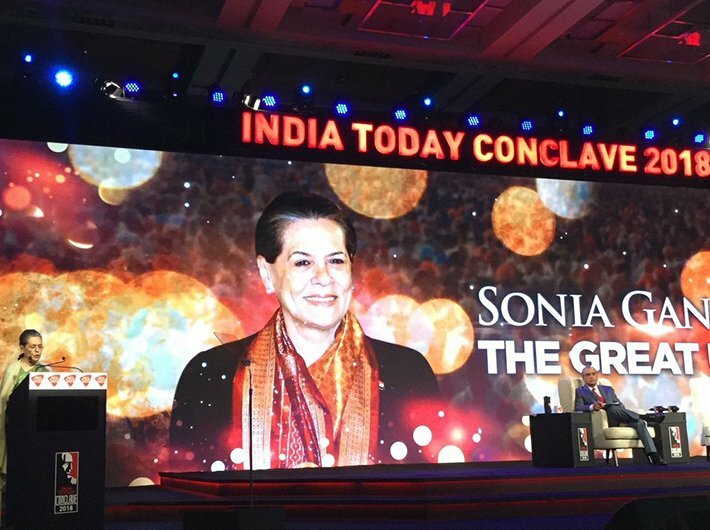 We might as well shut down and go home,” said Congress leader Sonia Gandhi at the India Today conclave on Friday. “We have not been allowed to speak about the PNB fraud in parliament,” she said referring to diamond billionaire Nirav Modi and his uncle Mehul Choksi who are involved in a Rs 11,300 crore fraud at a Punjab National Bank branch in Mumbai. Sonia Gandhi said she was confident that the BJP's acche din will actually turn into India Shining, “which is what brought us victory”. She stressed that parliamentary majority is being seen as a licence to stifle debate. On agenda for the Lok Sabha elections in 2019, she said that the BJP government makes "fantastic promises" but has failed to fulfil them. "There is great disappointment" among people, she said. “I am not fond of making empty promises and jumlas,” she added. She admitted that the Congress needs to develop new ways of connecting with people. On Congress chief Rahul Gandhi, she said that he does insist on having younger and newer talent for party to grow, but not at the cost of seniors. “We were in government for two terms and certainly there was some anti-incumbency. We were in a way out-marketed,” she said. She went on to say that Aadhaar was being turned into an intrusive instrument of control.